The Intersections & Beyond: 8th Cinemalaya Film Festival opens with "Babae sa Breakwater"
8th Cinemalaya Film Festival opens with "Babae sa Breakwater"
Babae sa Breakwater by Mario O’Hara is the opening film of the 8th Cinemalaya Independent Film Festival and Competition on July 20, 2012 (Friday) 7:30 PM at the Tanghalang Nicanor Abelardo (Main Theater) of the Cultural Center of the Philippines. The film is Cinemalaya’s tribute to the late screenwriter, director and actor Mario O’Hara who passed away last June 26, 2012. Babae Sa Breakwater tells of the life of Manila’s vagabonds who make the breakwater along Roxas Boulevard their home. The film features Gardo Versoza, Amy Austria, Lou Veloso, Lucita Soriano, Alchris Galura, Jonard Lomangaya, Ian Valdez and introduces its two lead stars Katherine Luna and Kristoffer King. 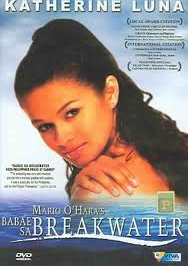 It was produced by Entertainment Warehouse, Inc.
After a 20-year Filipino film drought at the Cannes International Filmfest since Lino Brocka’s Insiang was screened, the independently produced Babae Sa Breakwater was invited for screening at the Directors Fortnight in 2004. Cinemalaya will run from July 20-29, 2012 at the CCP and July 21-29, 2012 at Greenbelt 3 and Trinoma. Twenty five (25) new digital films will compete on July 20-29 at the CCP, Greenbelt 3 Makati and Trinoma Quezon City. Cinemalaya will also feature about 60 films on exhibition. It also includes a variety of sections, namely the NCCA Premieres, Ani, Cinemalaya Documentaries focus on Early Indies and a special Retrospective on Mario O’Hara’s works as actor, writer and director. This year, highlights will include a retrospective of vintage and rare Filipino film ads in the collection of art patron Danny Dolor. The Cinemalaya Film Congress is a major part of the Festival. This year also features guest resource person Ralph Guggenheim of Pixar Studios. Now on its 8th year, Cinemalaya is a project of the Cinemalaya Foundation, Cultural Center of the Philippines (CCP), Film Development Council of the Philippines and Econolink Investments, Inc. It is an all-digital film festival that aims to discover, encourage and honor cinematic works of Filipino filmmakers that boldly articulate and freely interpret the Filipino experience with fresh insight and artistic integrity.